2013 Retail Star for Creative Excellence! The Guest Room is honored for excellence by Home Accents Today magazine! 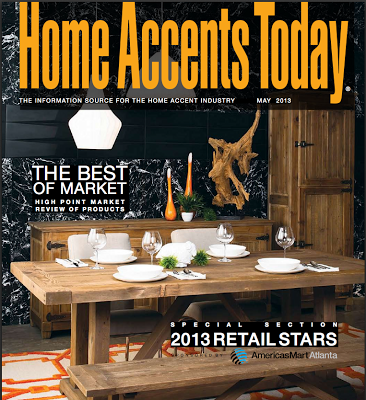 May 21, 2013, Greensboro, N.C. – The Guest Room, Leesburg, Va., has been named one of Home Accents Today’s 50 Retail Stars for 2013 by editors of the premier trade magazine for the home accents industry. The shop, founded in 1997, is located at 201 Loudoun Street S.E. and is owned by Debbie Mattens. The Guest Room’s merchandise features mid- to high-end lines of accessories, lamps, tabletop, garden décor, bedding and furniture, the latter of which is comprised of approximately 90% American-made product. Mattens credits some of her success to partnerships with local businesses. The annual list, now in its ninth year, recognizes independent brick-and-mortar retailers of home accents, including furniture stores and interior design boutiques, that are creative in their merchandising, have a positive presence in their local communities and are distinguishing themselves from the competition. The Retail Stars list is not a ranking, and is not based on sales volume. The businesses named to this year’s list are based in 27 states and Canada and are located in shopping malls, Main Street storefronts, renovated barns and historic structures, up-and-coming arts districts, LEED-certified structures and established design districts. Retail is not for the faint of heart, even in the best of times. The retailers on this list serve as role models to us all, not just because they were strong in the good times, but especially so because they have persevered through the bad. The economic downturn certainly took its toll on every retail sector, but beyond that, the e-commerce outlets and chain stores have stepped up their games, making independent retail even more challenging. The 2013 Retail Stars have faced down those challenges through an artful combination of innovation, customer service, marketing, merchandising and good old-fashioned hard work. We celebrate these successful merchants and encourage everyone to support the local businesses in their own areas. -Jenny Heinzen York, editor in chief of Home Accents Today. Members of the home furnishings industry were invited to suggest stores and retailers were encouraged to submit information describing their businesses. The list was compiled and narrowed down by research analysts and editors of the publication. The 50 Retail Stars list, sponsored by AmericasMart Atlanta, publishes each year in Home Accents Today’s May issue. The 27-year-old publication, based in Greensboro, N.C., is owned by Sandow Media.